A rendering of AltaSea’s campus. Photos Courtesy Gensler. The busiest shipping port in the US will soon be home to even more activity, thanks to plans to open a state-of-the-art ocean research facility by 2023. 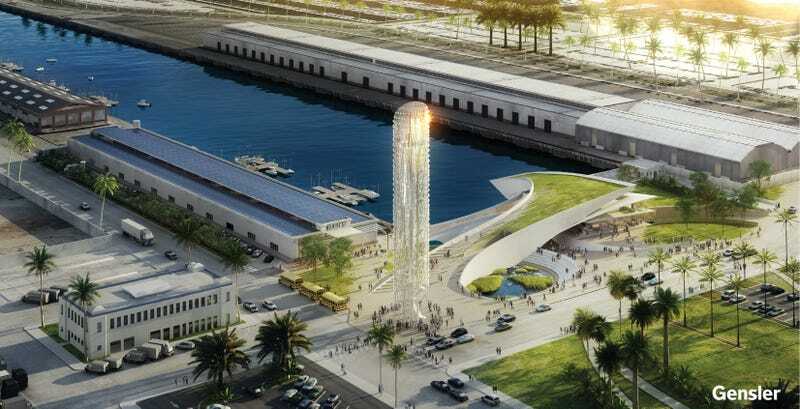 AltaSea released architectural renderings last month, designed by Gensler, for a 35-acre “campus of innovation” at the historic Port of Los Angeles. In a press release, AltaSea said having access to the port, which is also one of the country’s deepest, will create a unique space where experts could continue exploration of the ocean and conjure up solutions to environmental and sustainability issues such as food, energy, and climate security. “The ocean is our planet’s last frontier. It is where new solutions lie. There is no project more profound, more impactful, more critical for the tomorrow we hope for our children and our children’s children than AltaSea,” AltaSea Executive Director Jenny Krusoe said. The $150 million initial phase of the construction is set to begin later this year and will include renovation of 180,000 square feet in some of the historic warehouses, which will become the Research and Business Hub for other businesses. The construction will also include that of the Wharf Plaza and the Education Pavilion, set to be completed in 2017. A Science Hub that will contain the Southern California Marine Institute, is set to open by 2020. The final piece, an Engagement Center for public education and exhibitions, is set to open by 2023. The campus will be built on City Dock No. 1, which, according to Co.Exist, was built nearly a century ago to help the city gain access to the Panama Canal. However, since it was built on a landfill, it became useless in the 1960s after shipping containers became more common. In addition to providing environmental sustainability solutions, the compound will also be powered by renewable energy and rooftop solar fields. Here’s some more renderings of the future campus.